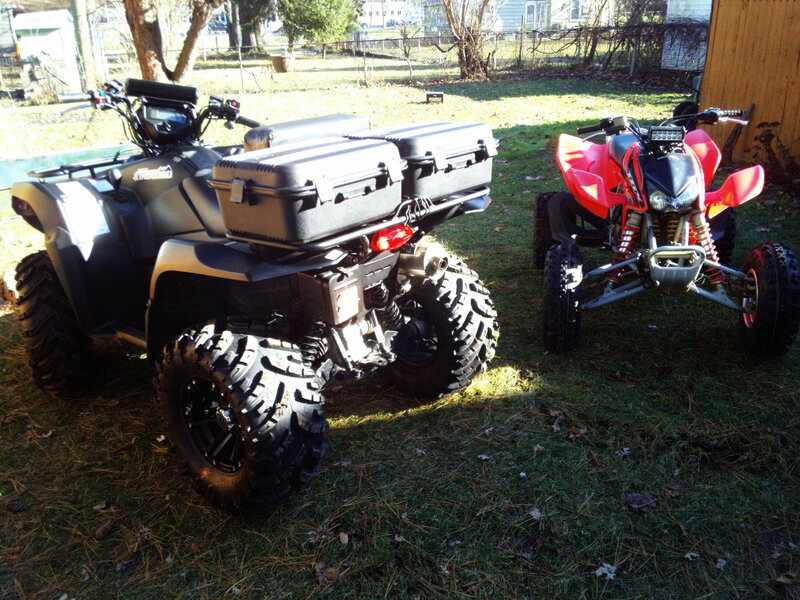 my trx450 seemed big to me, until i bought this KQ750 dwarfing it in size! I still love them both, best quads for the money! I'll keep looking/asking/posting, until I find someone to join me for trip out, up north here, when weather improves. I've been exploring many trails, every year, almost every week throughout riding season there, since 86 and can offer many terrific hidden gems over hundreds of sq miles! I prefer to ride/camp with one other person, helps to cut down on dust and odds of mishaps. "Don't ride alone, not safe". You got that right. I was riding alone in the winter a long time ago and got stuck so bad I put the key in my pocket, grabbed a few things, and started walking. Luckily, some people smart enough to ride in a group came by and helped get me out. I thought I would be okay since I had a winch, but it couldn't pull me through all that snow back to the trail. Maybe if I anchored the winch up in a tree and made a bunch of pulls to go around in a U it would work, but I don't climb snow covered trees. You might check and see if there are any local ATV clubs. Thanks but I prefer to ride with one other person, keeps trail dust down and too many mishaps with large groups. The guys I ride with will almost always stop any time they turn off a trail to a road, a road to a trail, or from one trail to another, even if it's marked and they think everyone knows the way. Sometimes you can miss seeing the black on white arrow if there even is one. Sometimes they just have the ORV trail markers turned sideways with the point on top of the orange triangle pointed where you turn. I've missed those completely before. I think we all have at one time or another. Sometimes the guy ahead of me will stop and wait at intersections where we keep going straight and I'll tell him don't even wait for me if we don't turn. And if someone gets lost they sit at a corner and wait for someone to come back. It probably won't be near the last place we saw each other but the guy who usually leads is good at reading tracks and always makes it back to you. Clubs are full of people just like you and I'm sure there are others looking for someone to ride with too without having to ride in a group. I like my KQ 750 too. I was looking to buy a Grizzly 700 instead but couldn't find one for a decent price used. So far so good.